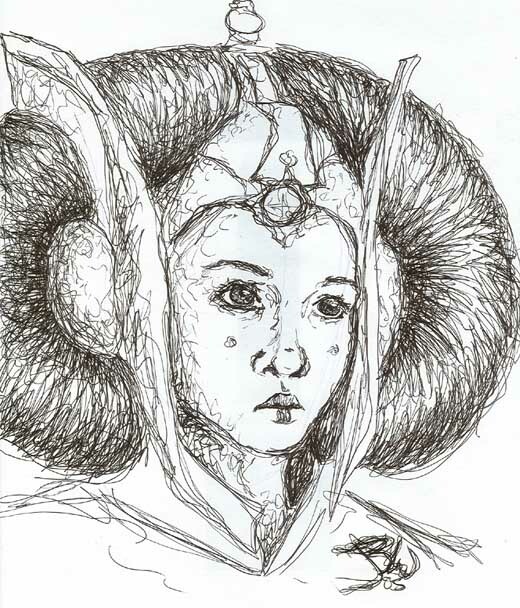 Foramally Titled- 'Amidala:So young, so lost' which was kinda stupid, so I changed it. This picture is dedicated to my elementary art school teacher, as proof that there IS such a thing as scribbling in art. I made this literally in less than a half an hour. I did have a picture for reference, and I was considering coloring it in, but it looks so much better this way. I just bought TPM recently, so this was kind of brought on by that. I know Amidala was supposed to be really young in the movie(14 i THINK), so I drew a picture that i think kinda represents her vunerability and hopelessness to the invasion of her planet. I was really really pleased with how it came out. Nehoo, Reviewsare welcome, constructive critiques and critiscism greatly appreciated, and most flames will probably be ignored. *I forgot to say its done in pen. THIS IS amazing! YOU'RE ON MY FAVE ARTISTS LIST NOW, TOTALLY!! Done in PEN?! *gawks* It's so goooooooooooooooodddddddd.....O_O!! wow this is pretty and amazing!!!!!!! !